I am still working out the idea of circle and olives in an oil painting. In this still life painting I did an orange underpainting to warm it up.The underpaintingis where you build the foundation of your painting. I again took the idea of the cups,olives,ladybugs and dragonflys and gave it a little different twist. I have a few more ideas for this theme and will keep working with it. Olives and Lady Bugs, the wonders of a wondering mind. I started this painting thinking about dots and drew the cups. When I decided to make them green with red dots my mind went to olives. I added the lady bugs because they look like red dots, then the dragonfly because I gave it red dots for eyes. Now that I have painted this I know I want to paint a few more making some changes with them a s I go. Oh the wonders of an artist with a wondering mind. Still life painting of yellow roses and red wine is painted in oils.My roses have big buds and will bloom this week but my neighbors are in full bloom so it's time to paint roses. I have been busy in the yard planting vegetables in my garden and weed and separating flowers in the flower beds. Not all perennials need to be split but many will benefit from the procedure. This original oil painting is for sale. Strawberries are in season right now so they are good thing to paint. They only stay fresh for a day when you are using them in a still life so no do overs if you are not sure if you go it right or not. I can see that I need some smaller brushes for the little seeds and the hight lights around them. Yesterday was the a glorious day of sunshine. I worked in the garden all day pulling those nasty old weeds and planting flowers. Flowers that could grow up to be wonderful subjects for painting to come. My mind was a whirl of ideas. My goal for the day was to put in a small fountain. I hauled wheel barrel load after wheel barrel load of stones to the spot where I want my garden creation to stand. I had a visions of a bubbling little fountain where the birds from my garden feeder could stop for a quick drink splash a little and be on their way. My arms ached from the realty of my vision,my back finally gave out. As an artist in the mist of a creation I refused to let physical weakness,blistered hands,and a hot steamy day win. I could not let my dreams vanish into the humidity of the day, so woman that I am, a woman with tools,I took out the back hoe and carried stones back and forth in the bucket. I am still in the mist of my project today. I have to make a quick trip over to the Mill to order a load of mulch, then back to work on the project. I have seeds to plant and much more in mind, my creative mind is in the garden today. It is still in a whirl of ideas. I painted a group of hens in a farm yard a few days ago and I really liked the way it turned out. I am my own best and worst critique depending on the day of the week. I wondered if I could get the same feel with other birds so having talked about reds yesterday I thought I would give flamingos a try today and I made them pink because those are my favorite kind of flamingos. When you live any Michigan any pink bird seems very exotic. I think when I first started to paint reds were the most difficult for me to work with. It I am working on a long term painting project where I have the luxury of letting it dry for days between painting time I can use the old masters technique of glazing to get it just right. 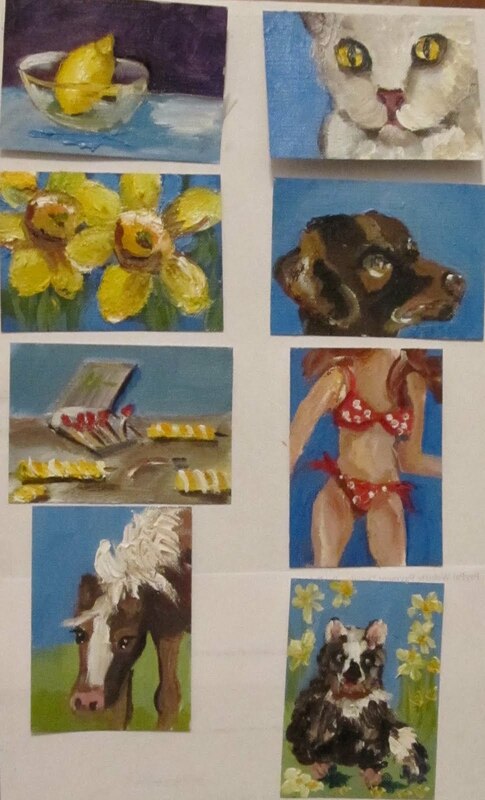 My small daily paintings are done "alla prima" so I work on Value, Intensity and Temperate right from the start. When I look at the strawberries I see red so I put down a light wash of red to get some of the general color in. Intensity goes from light to dark in most colors you can lighten them by adding white but if you do this red you get pink. Pink strawberries are not what I want. After I have the general color I put in the darkest dark and last the lighter color, yellows and oranges work to lighten the value. Once I have the general colors down I move on the intensity of the color grays and browns are at the low end while orange is at the high end. The most vivid red of the strawberries are the area that is closet to me. That would be the bulge of the berry. I now look at temperature. Red is a warm color so the shadows will be cooler with some reflected general color. I am always working on my red trying to get them just a little better. Well at least the berries are not pink. I was interested in playing the blue vase against the yellow of the flowers. I add the orange to help bring the viewers eye into the painting and add interest to the painting. About This Painting: I went flower shopping today and bought a lovely hydrenga to plant in my birdhouse garden. I spent most of the day weeding the garden, trying to figure out just where the right spot should be to plant my new treasure, while a little bird sat on top of one of the bird house giving me the eye. My strawberry plants are full of berries right now so it seems like a good idea to paint strawberries. If it stops raining I am thinking of going out into the garden and painting some on the vine. 5x7 oil on canvas mounted on hard board. Crabby Billie available at my Ebay Store. About This Painting: I have been taking a break from oil painting for a few days. Sometimes it's just fun to play with something else. In a few days I think I will try painting some poppies in oils just to feel the difference between oils and watercolor. About This Painting: It rained all day today and was so cold. I wanted to paint something warm and colorful.Poppies always make me think of sun shine. This is a watercolor painting. It is 9x11 on 140 lb cold pressed watercolor paper. The Plien Air Season has started and I will be posting at least one Plien Air painting a week hopefully more. This painting was painted on a very rainy day last week. Staregazer Lilies (H09-8775) painted in watercolors on 140 lb coldpressed watercolor paper. The painting is 9x12 and matted in a white acid free matt to measure 11x14. A focus on texture in this oil painting of sunflowers. I spend many enjoyable hours painting and growing flowers. I have been told by many galleries that they have enough floral artist so I must not be the only one who love to relax and paint a vast of flowers while sipping my morning tea. I drink coffee when I want more drama. A midwest Farm on a stream in Michigan. Are You A Daily Painter? As you know I am a daily painter . 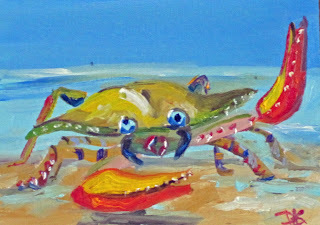 My daily painters gallery can be visited at Daily Painters. 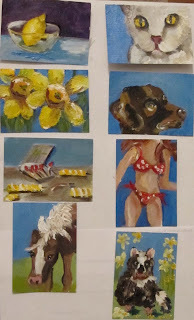 If you have been painting for a while and are up the painting a small painting daily maybe this group is for you. We're looking for the next Daily painter . . . Will it be you? Win one year of free membership to DailyPainters.com, and $500 from Blick Art Materials! About This Painting: Barns are something we see everyday here in the midwest. There is something about them that makes you want to keep the image and not let it fade from our culture.